Use this registration if you're an ASCGWA active 2018-2019 Paid Member. *ASCGWA Members will be able to add additional guest tickets as part of their registration. Use this registration IF you have a PERMANENT RESERVATION* for your Luncheon, and would like to pay for a Guest to attend. *Permanent Reservations are pre-paid guaranteed seats for all luncheons for the 2018-2019 club year. Please RSVP AND PAY NLT November 8! Currently registration is limited to members bringing 1 guest. 100% of your registration fee is refundable if you cancel prior to the RSVP date listed above. AFTER the RSVP date has past, money cannot be refunded. Please email the ASCGWA web admin immediately upon finding out that you have to cancel your reservation. Thank you. What if I want to add a guest after registering? 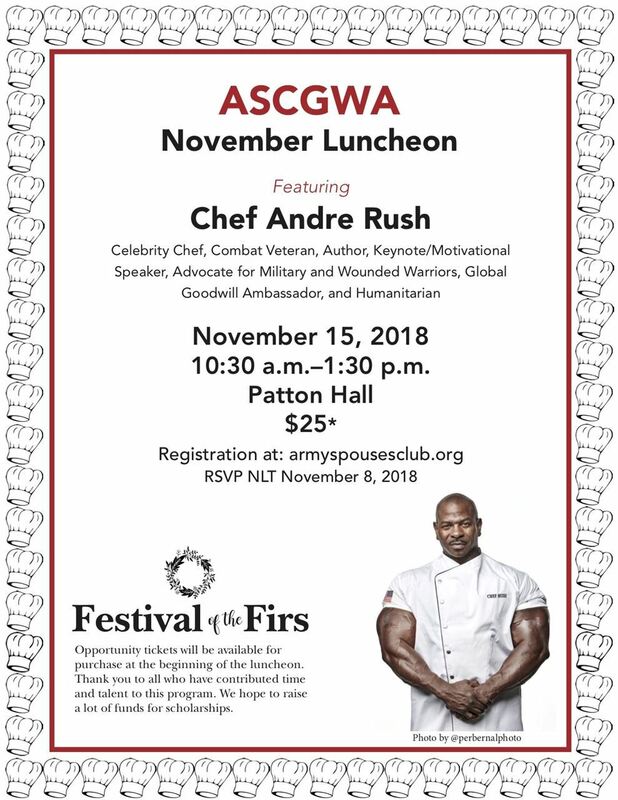 You may add a guest no later than Friday, November 8th by emailing reservations@armyspousesclub.org.